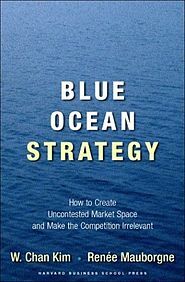 Blue Ocean Strategy: Uncontested market space or innovative differentiation? I had a considerable amount of trepidation when reading this book by W. Chan Kim and Renée Mauborgne. The title itself is ellusive and doesn’t lead the reader to understand the value that it might have for them. The subline is a bit more useful “How to Create Uncontested Market Space to Make the Competition Irrelevant”. A better byline would have been “Major differentiation through innovation”. You see, you will never make the market uncontested permanently. In today’s day and age competition is quick to catch up, maybe that wasn’t the case 7 years ago when this book was initially written. I put what I had heard of this book aside and read it. Surprisingly for me, I enjoyed most of it. The first four chapters are what I would consider a must read for any manager, leader or product owner. Why? Because it fills a niche where there is a hole – how to create a differentiating and innovative business strategy for your products. It won’t guarantee that your strategy works. It won’t really help you execute your strategy either, but it is a sensible thought process for where strategic ideas could be lurking. When I had finished reading Lean Startups for the first time my immediate thought after “this sounds like a great way to execute an idea” was “what idea should I execute?” This book gives you the tools to be able to seek such an idea within yourself. Blue Ocean Strategy is the Yin to Lean Startup’s Yang. Similar, but different. Each valuable, but together a powder keg. So what is it exactly? Well despite what the authors will tell you, it is a strategy set of practices based upon a theory presented by the authors. The theory they have surmised after analysing numerous companies is that the only thing that makes a company successful is major differentiation through innovation (my words not theirs). All too often organisations spend an inordinate amount of time and money on catching up with other competitors or trying the win customers from the same pool. Blue Oceans (or as I like to call it innovative marketspaces) are about finding a new set of customers by differentiating in the market at a more macro rather than micro layer. The book sets this up through a huge number of examples that clearly present their case. One of the key tools they use is a simple graph that anyone can use to describe their product and their product differentiating characteristics. Below is an generic example of such a graph. Sounds sensible right? But real insight generally is sensible like this and they give excellent examples throughout to back it up. Most of the examples succeeded not because they used this strategy, and it should be noted that they have given no proof to their work nor were they able to recognise the success rate of innovation. It made me think about the companies that I have worked for and the competitors that grabbed some of the marketshare. Certainly they found a characteristic, focussed on it and were rewarded. I could see some validation behind this. Then I was curious about organisations that had actually used this and whether they have garnered success. Nintendo is known to be using it – Wii and 3DS were born and arguably they are having success. What is interesting is that as soon as a company creates differentiating innovations others will try and catch up – just look at Connect as an example. Another described project is the creation of the F-35 fighter jet. This jet was meant to be packaging intra segment opportunity – a navy, marine and airforce plane in one. The product characteristic graph for it is interesting but if you have a look at the project which is now eight years overdue and with a price tag of $1 trillion dollars you have to wonder whether it was worth it. Interestingly constant change of requirements has been labelled the cause for the blow out. So maybe the product charactistics were a too simplistic approach to the strategic problem? But it did make me think about how this might apply to Agile. A graph could easily be made to demonstrate the differences between Agile and Waterfall. Similarly one for Scrum and Kanban. One can be created to define the opportunity that exists in the market. I have seen one done for managers and leaders – of what their current characteristics are versus what the strategy was to move them to it. It made me consider the Rightshifting proposition and the characteristics of the Analytic versus Synergistic mindset. This is a simplistic version of it, and no doubt I will have some (all?) elements wrong (read the 10% as low focus on and 90% as high focus on). Where can this graph be improved/corrected? What sort of things can we consider from a strategic perspective? Lastly, whilst I do believe there is value in reading the book you should open yourself up to other thoughts in the community. The Blue Ocean Strategy has had many scathing reviews of it. Many of the points in the less than positive reviews I do feel are valid. Personally it is just another really simple tool that you can add to your toolbox. You won’t use it everyday, but one day you might need to take this tool out.